This months challenge is Thin Line Design. We had two options for achieving the design: basic and advanced. 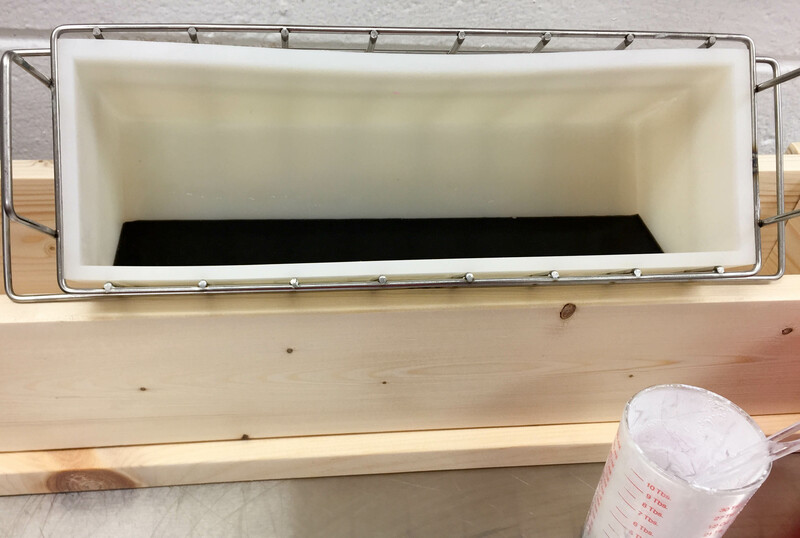 I chose the basic design which involves pouring the soap down the side of the mold in as thin a line as possible. I decided to use squeeze bottles to assist with the pour as I thought it would give more control. The first few passes were made thicker than planned thinking it would help keep the thinner lines flowing. If I do this design again I will make all lines thin but that “if” is questionable. 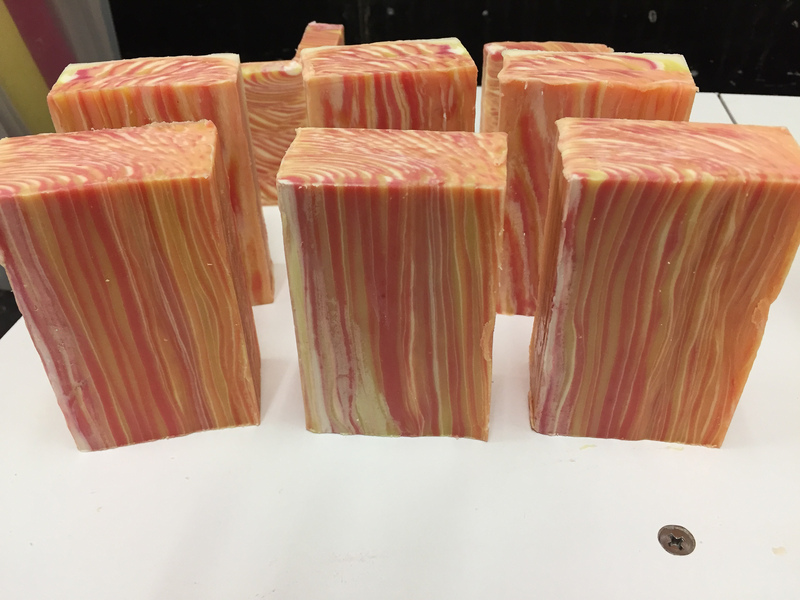 While I love the way this soap turned out, it was one of the most tedious techniques I have done. 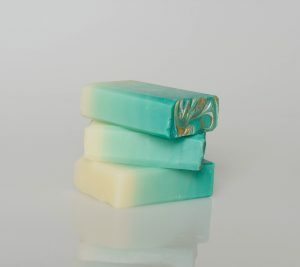 Knowing this technique would require more time than usual it was important to choose a fragrance that would allow the soap batter to stay thin the entire time. 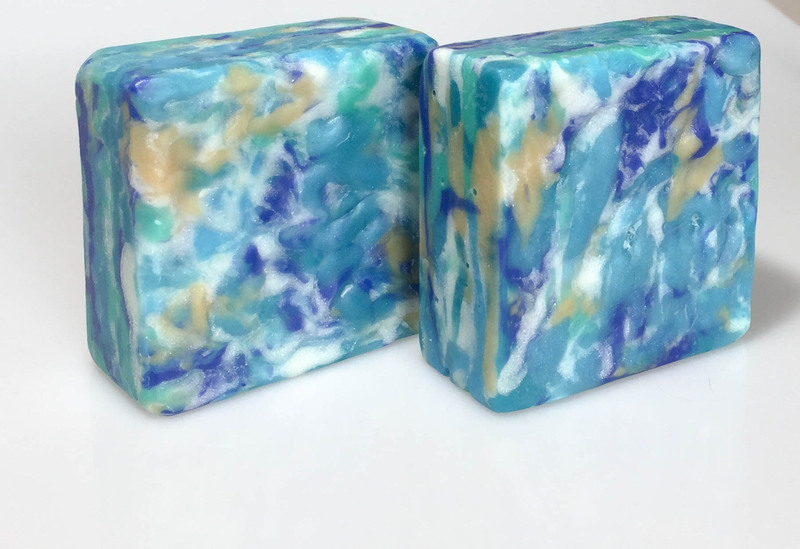 So old faithful Energy was the choice but to change it up a bit I added Champagne fragrance to it. The combination turned out very nice and achieved the goal. Squeeze bottles ready for soap batter. First few passes were poured thicker than necessary. Luckily the soap was poured thick enough that the bottom layer could be planed off. All done. And I must say my hand was definitely ready to stop squeezing. 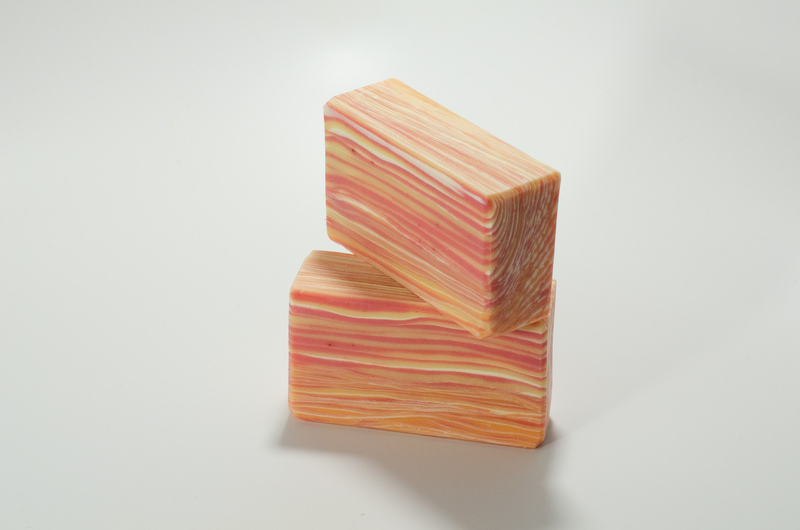 This soap was cut into three blocks and then horizontally so the lines would show. 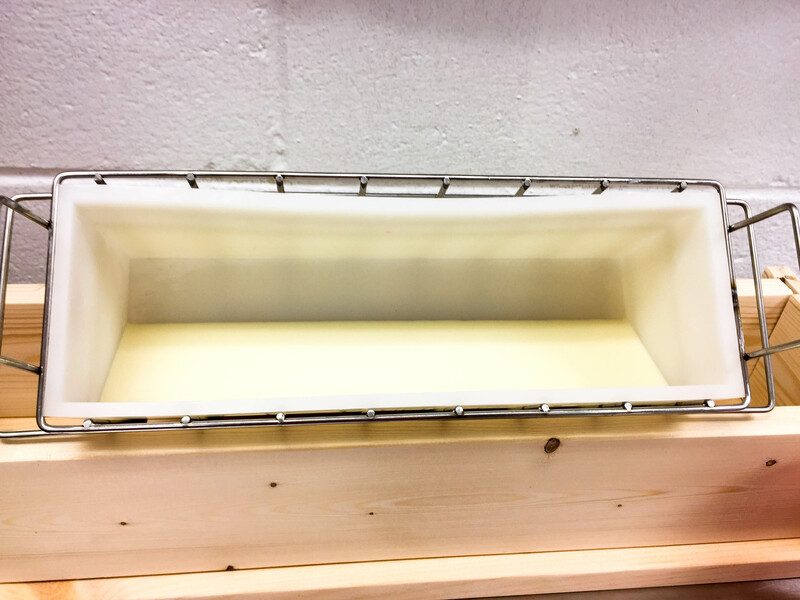 After waiting three days before removing the soap from the mold, it was still too soft to trim and clean up. 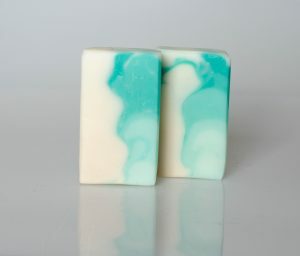 Fortunately I had not waited until the last minute to make the soap as usual. 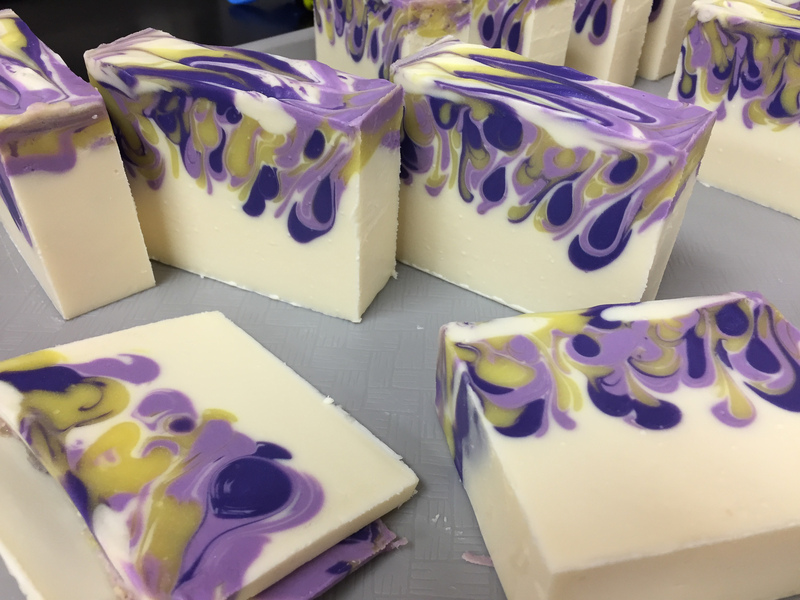 I am pleased with how this soap turned out (also how this soap looks on ends). Thank you Amy for another challenging challenge! The Soap Challenge Club is Active Again! It has been a long time since I last posted. 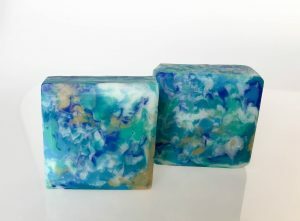 With all my good intentions to use this site to keep you informed it seems I only actually used it for posting my Soap Challenge Club entries. The club challenges unfortunately cessed at the end of last year BUT they are beginning again this month. I can’t tell you how happy I am – the challenges pushed me to learn new techniques and to be more creative. This month’s challenge is a mini drop swirl with two options for the technique. The first option which I choose is supposed to be easier than the second. I would say neither option is easy. A rather large wholesale order had been keeping me busy and then Hurricane Florence decided to hit North Carolina. The hurricane knocked out the power at my workshop and we were only able to get back to work this past Thursday – that was one whole week out. My first attempt on Thursday was a miserable failure because the fragrance that was not supposed to accelerate trace did in fact do that. Then on Friday we tried again. 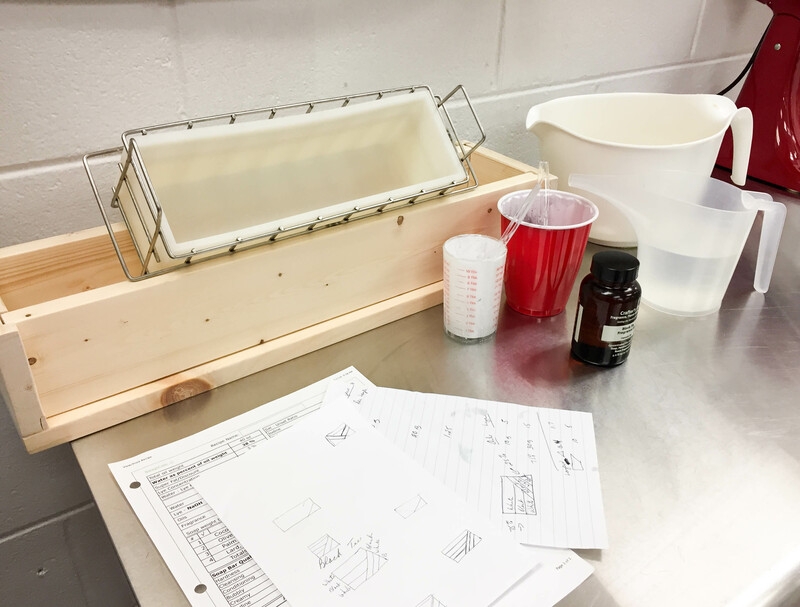 This time our soap batter remained fairly fluid and we completed our design. Thinking the entry deadline was Sunday, I removed the soap from the mold on Saturday. It was very soft and mares easily but I am very happy with the results. 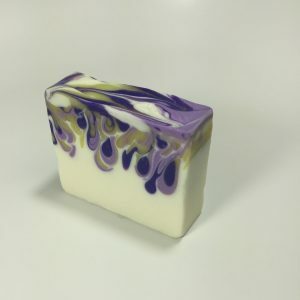 The soap is scented with Lemon Lavender which smells devine. Because of time constraints I did not document the steps to make this soap. Basically it involved making the soap base white and filling three squirt bottles for the colored part – dark purple, purple and lemon yellow. 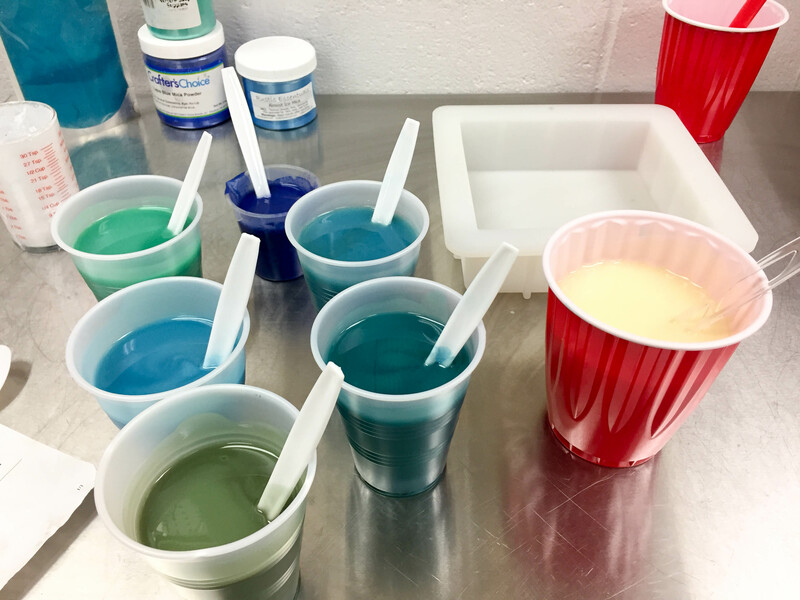 After pouring the base, the first color is squirted in rows trying to force the color down into the base. 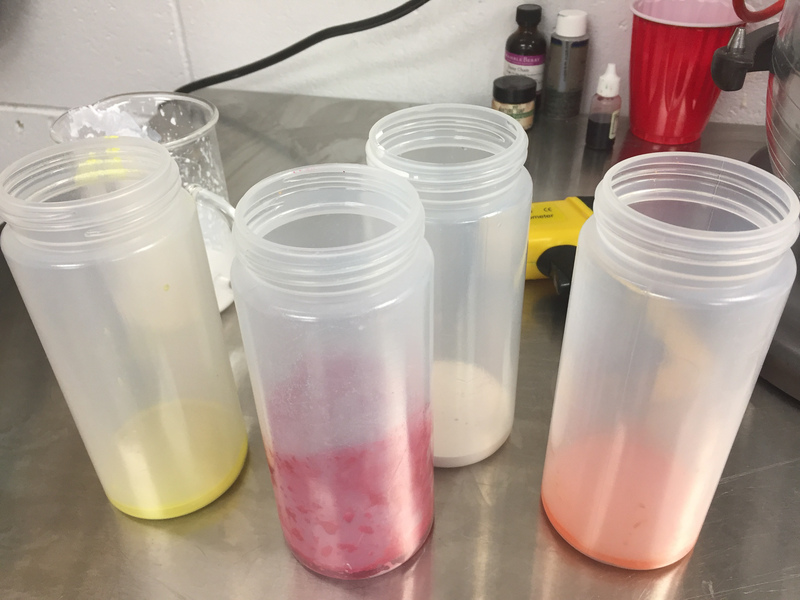 You proceed alternating colors until your bottles are empty. Thank you Amy for bringing the Soap Challenge Club back and for this fun challenge. I am looking forward to next month. 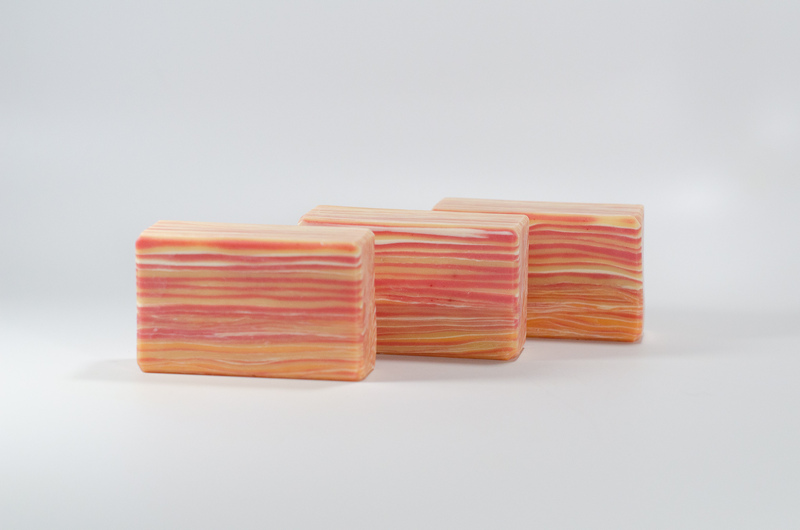 I am so sad to say that this will be my last post regarding the Great Cakes Soap Challenge. But I am very happy for Amy who has hosted these wonder challenges as she is moves forward with an exciting opportunity with her company. I have enjoyed these challenges and appreciate all the hard work Amy has devoted to the Club. Thank you Amy! This month’s challenge is straight line designs. The idea is to create a soap with straight lines for the majority of the soap using as many colors as you would like. 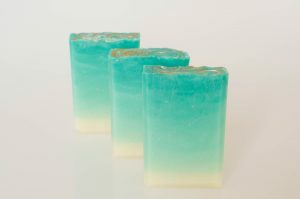 The soap must be cold process and use a log mold. I have been meaning to to make another soap for my son using his favorite “Black Tie” fragrance, and since my plan for the challenge was to keep the design relatively simple with just two colors, a black and white soap seemed perfect. I didn’t want to do just horizontal lines so the plan was to turn the mold so the first pours would form a triangle and then turn the mold and pour horizontal lines. Alternating the colors for the horizontal pour – white black white. 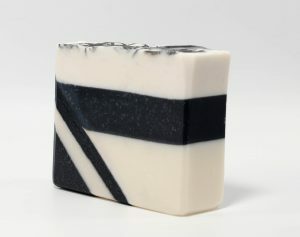 Although the last layer of the triangle was firm, some charcoal migrated into the new white soap. I thought about trying to remove it but decided it probably would not be noticeable since the next layer was going to be black anyway. 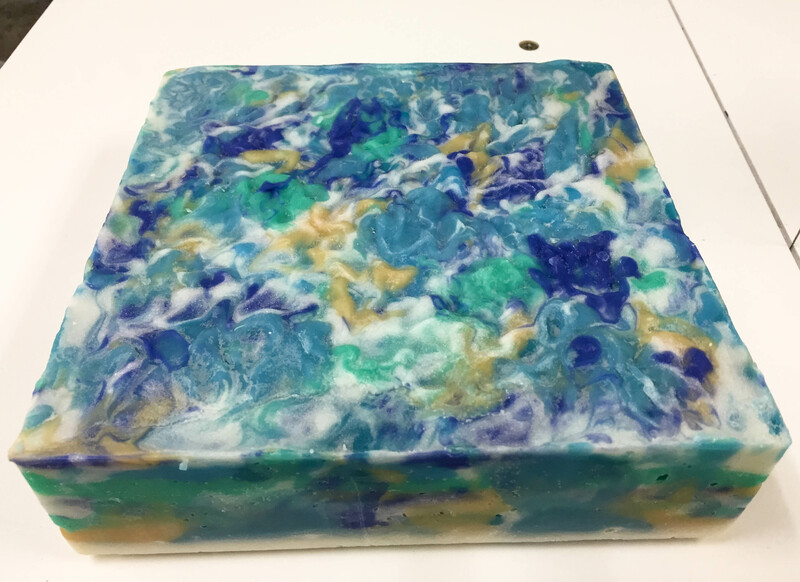 The next pours went as planned (the pics are pretty boring so I left them out). 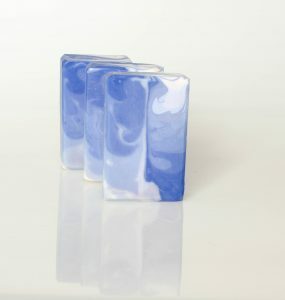 This is the swirled top. 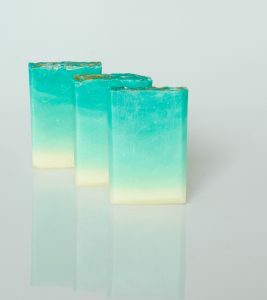 The soap did go through gel phase but was still too soft to cut the next day. 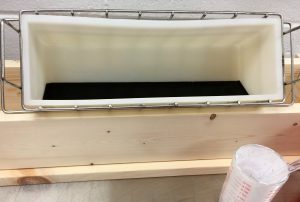 I was so anxious to see it – that is part of the fun of trying different designs – you never know what you are going to get. I finally got it cut but with not much time to spare. Posting this just hours before the deadline. 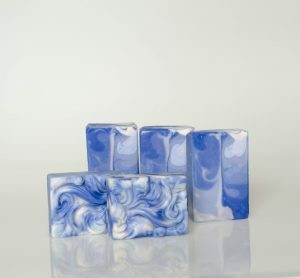 Here are some photos of the cut soap. I think my son will like it and I am pretty pleased with the result. 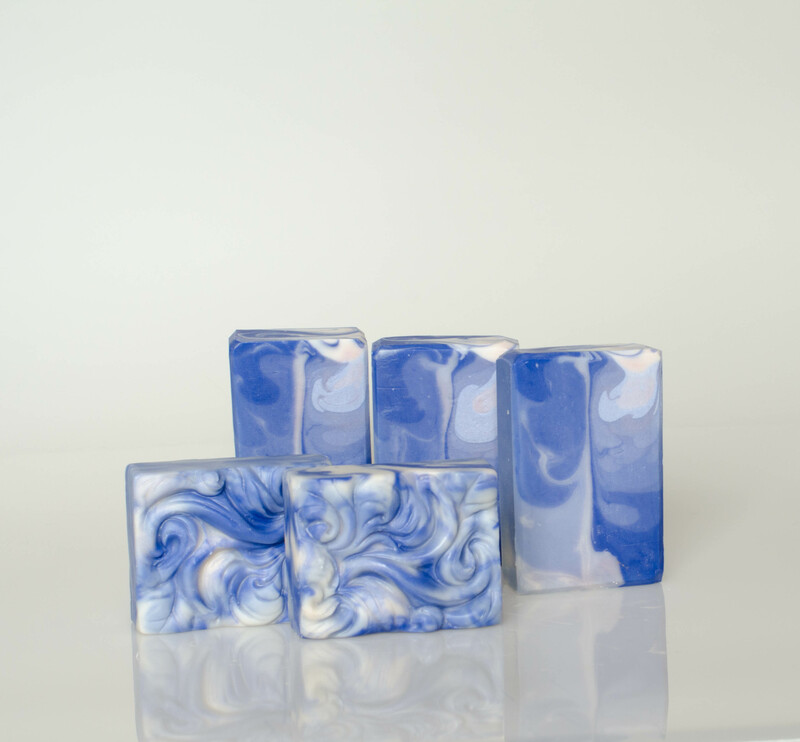 Amy thank you again for your dedication and efforts that made the Great Cakes Soap Challenge Club such a success. Each of the designs were unique challenges and learning experiences. And Amy I especially loved how supportive and encouraging you were to everyone who entered. 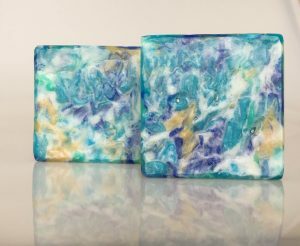 I know for a fact that I am a better soap maker as a result of participating. This months soap challenge is similar to the fluid pour acrylic painting technique – we were allowed to pour our soap batter but could only use a straw to blow the design we wished to achieve. The most common design using this technique (at least the most used in the videos I watched) was the flowering technique. You pour a single color or multiple colors in the center and then use the straw to blow the colors out in a flower like pattern. 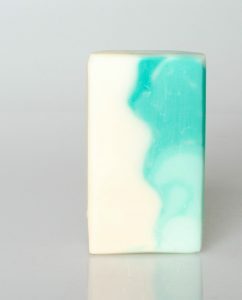 But I wanted something different what I had in mind was to make my soap look like waves with white caps and I would call it angry seas. I knew that most of the ocean/ozone fragrances tend to accelerate how the soap sets up. 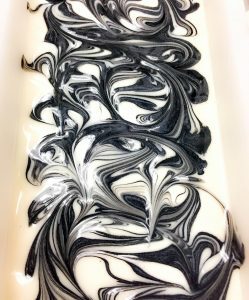 For this technique you need a soap batter that stays fluid. I have a fragrance called Sea Kelp by Rustic Ecsentuals so I checked their listing description and read “CP Notes: No discoloration, no acceleration. 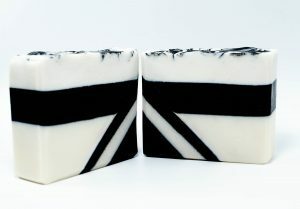 Soaped like a dream!” Yes this would work! My oils and lye were around 100 and everything seemed fine. It took a few minutes to mix the colors because there were seven of them. 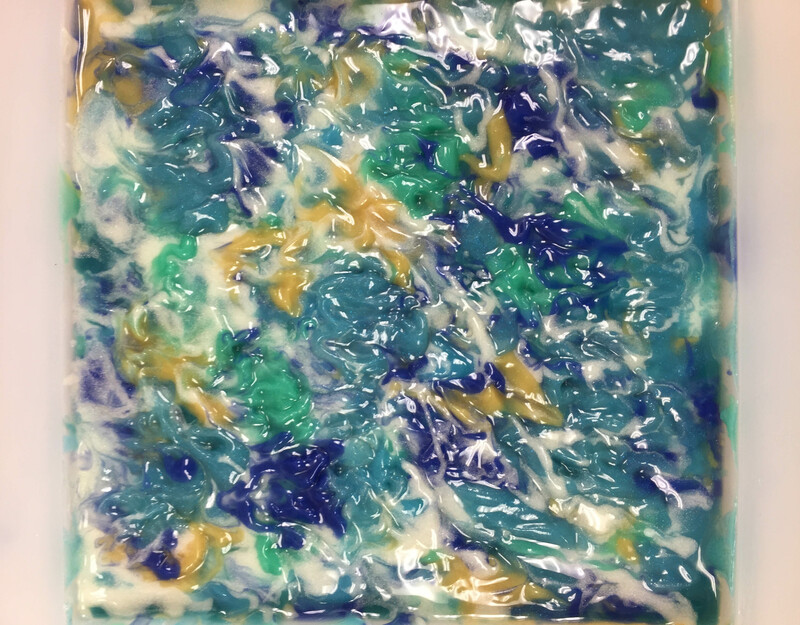 Well by the time I started to pour, the colors were starting to get thick. 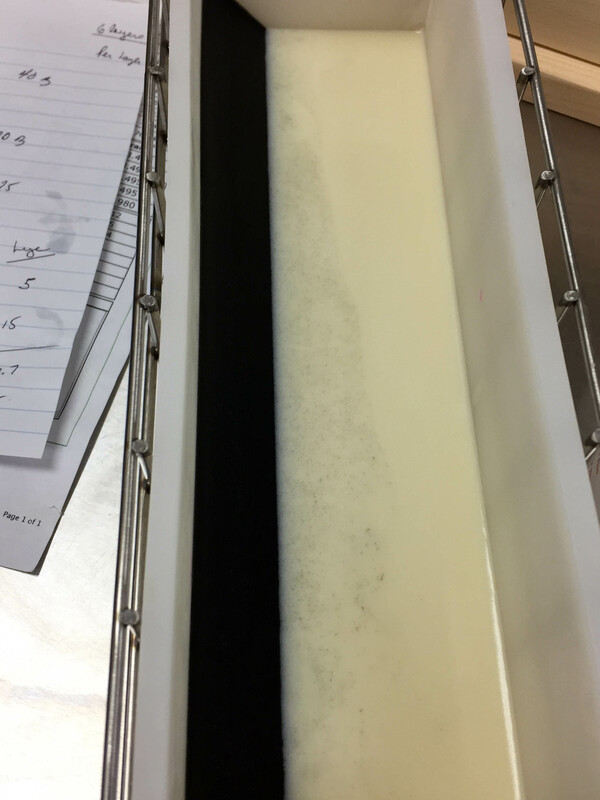 Technically it was not acceleration – it wasn’t soap on a stick- but it was thick like pudding. 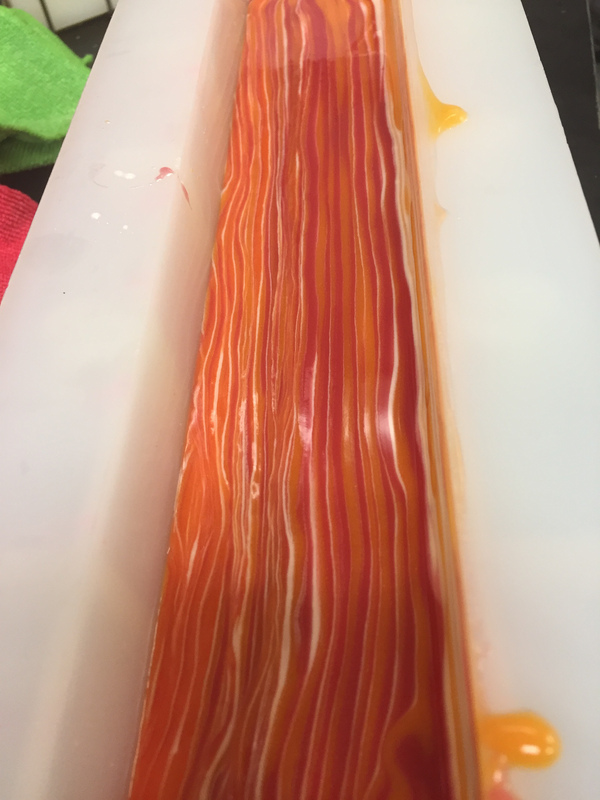 I decided to keep on going and poured a thin layer as my base then my idea was to pour lines across the mold and blow them to look like waves. There was a box of straws in my drawer that I use to make imbeds for my watermelon soap that I planned to use. The minute I put the straw in my mouth I knew I was in for more trouble. 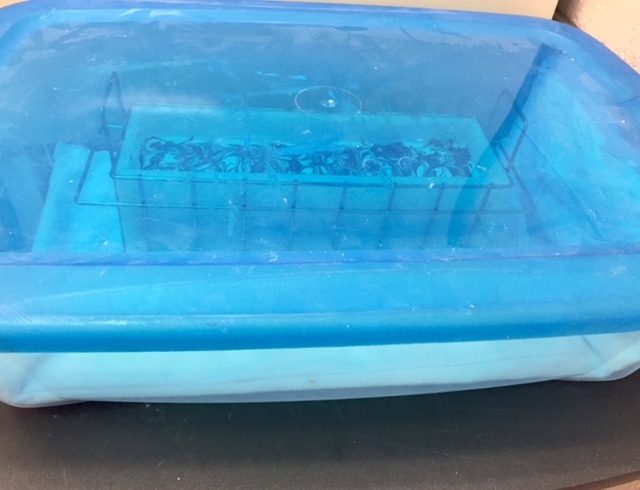 It was a larger than normal straw and I couldn’t get enough air flow to make the soap move. What to do? I couldn’t stop now. So I began to frantically look around my workshop for another straw or something that might work. No smaller straws anywhere but I noticed a bag of pipettes. I cut the end of a pipette and it worked. 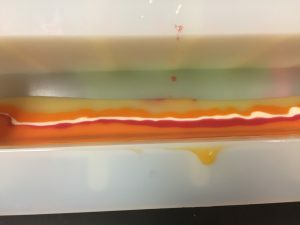 I was more than a little concerned because the pipette was so short with the end cut off – I would have to be extra careful about how I handled it. 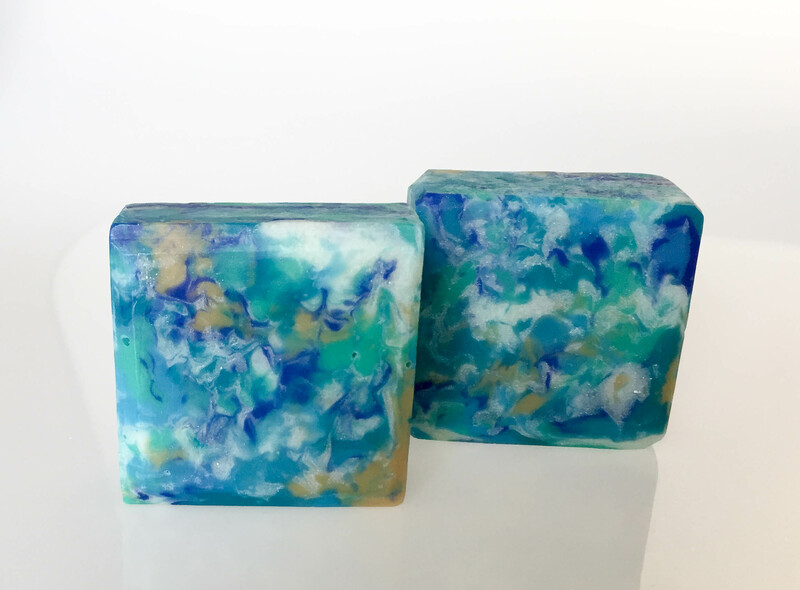 With the soap thicker than it should be the blues didn’t blend together the way I wanted so I decided to keep rotating the mold and pouring the waves in different directions before using my make-shift straw. Then another mishap – the lovely green that was going to blend in with the blues turned mustard yellow. Oh well that will work – we will just say it is the angry sea churning up the bottom. Although I didn’t get exactly what I had envisioned, I am pretty happy with the results. (I had to be – there is no time for a second try). 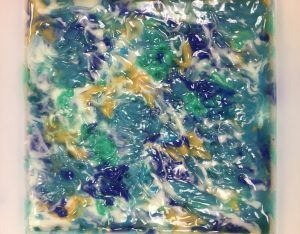 Finished pouring and ready to go into a tub with a heating pad to try to force gel. 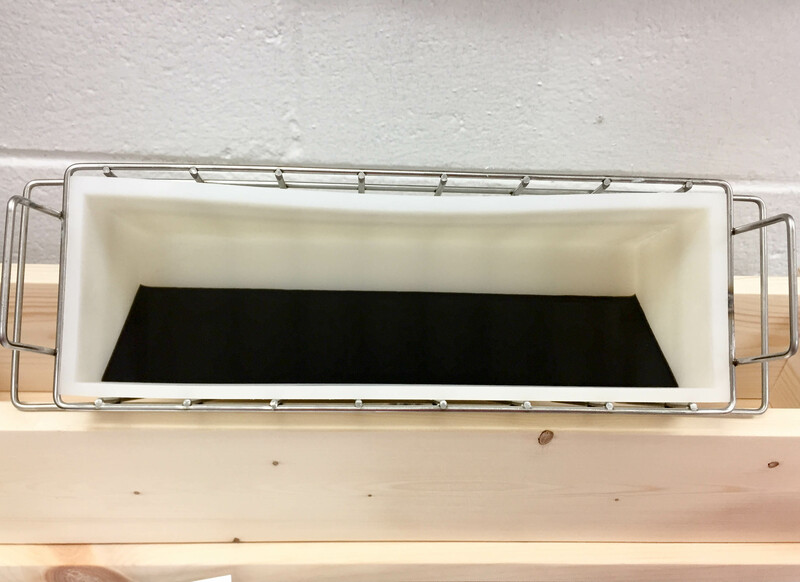 Oh how I wish I had an oven in the workshop. 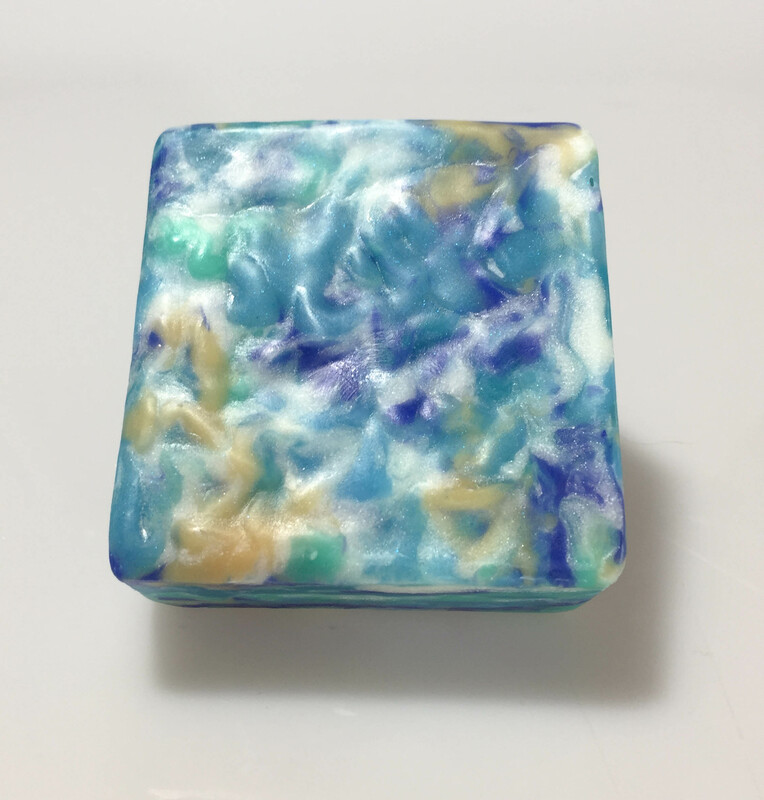 It has been a while since I participated in the Soap Challenge Club. This month’s challenge is an ombre gradient design. 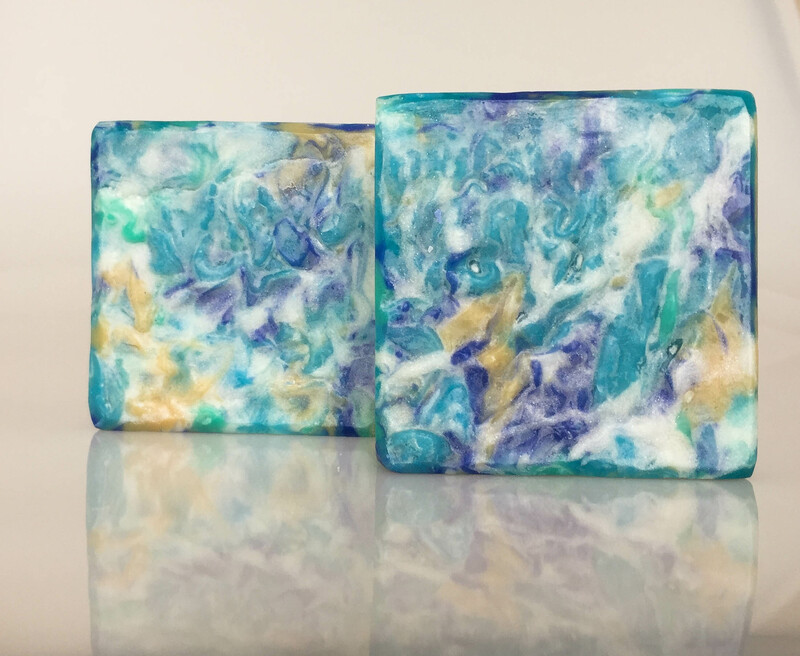 This is one of my favorite soap designs so I was surprised that it took three tries to get one that I felt I could enter. 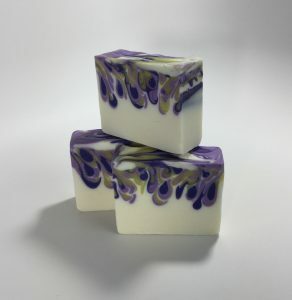 For my first design I used a divider in my soap mold with the intent of having one side start with the darkest color and the other side start with the lightest. The first problem was my soap was to fluid and the layers were not distinct. 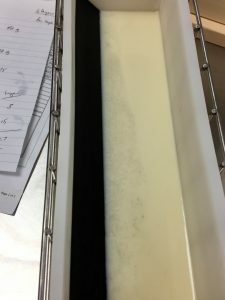 The second problem was the color I started with on the dark side was just too dark and never got really light – in the end I add some titanium dioxide but the resulting color just doesn’t look like it belongs. 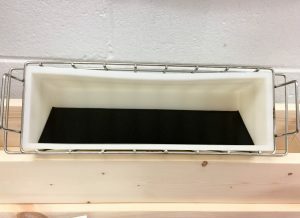 And then when I removed the divider the white soap on the bottom of the light side migrated to the upper layers. For the second try I decided on the tall and skinny shimmy design with teal on one side going from light to dark, The other side was supposed to be pink going from dark to light. I used Brambleberry’s Rose Quartz mica which is a lovely pink color. 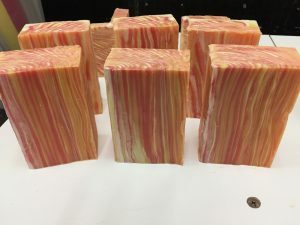 EXCEPT I missed the notation on the front of the jar that reads “Not recommended for CP soap” so my pink side is just one shade of white (seems I always learn something for these challenges, i.e. never use a color in a challenge that your haven’t tested). 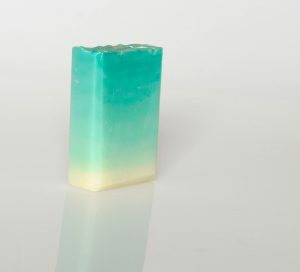 Again my soap was too fluid. Then for the third and final try I went with just a standard ombre design in teal going from light to dark. 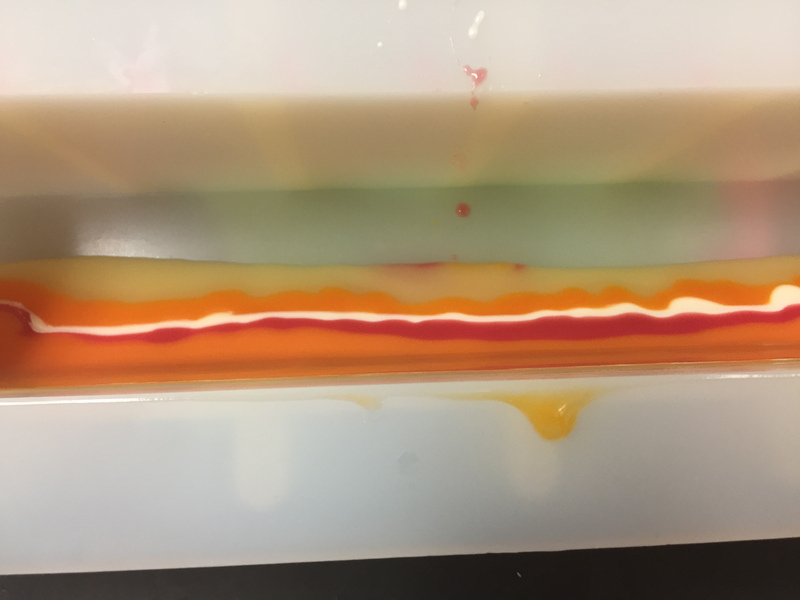 My intent was to pour relatively thin layers so the color change would be gradual. I am pretty happy with the results. Thanks Amy for yet another fun challenge.